Deep-drawn cup designs may contain tapered walls, partial dome-shaped bottoms or full hemispherical-shaped bottoms. 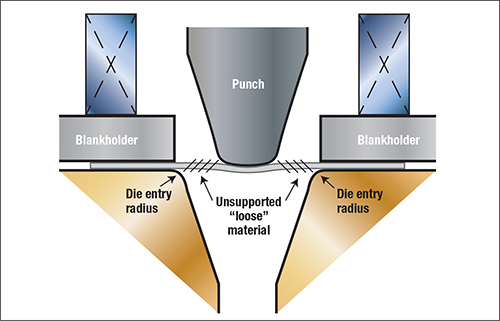 All of these designs require high blankholder forces; insufficient blankholding forces can cause improper forming of the loose material between the punch contact point and die-entry radius. Puckers, buckles, waves and wrinkles can develop in the unsupported regions (Fig. 1). 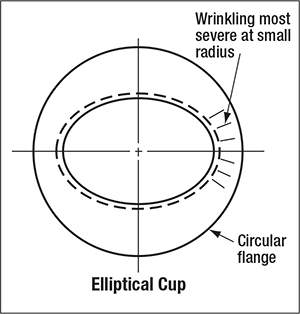 Drawing cups with tapered walls (sometimes called “cones”) directly from a flat blank requires substantial blankholder forces to suppress buckle formation. The likelihood of the blank fracturing or splitting early in the punch stroke is high, due to the small punch-face diameter relative to the diameter of the die cavity and the relatively tight radius in the cup bottom. To successfully draw a cone-shaped cup, consider using a stepped approach. 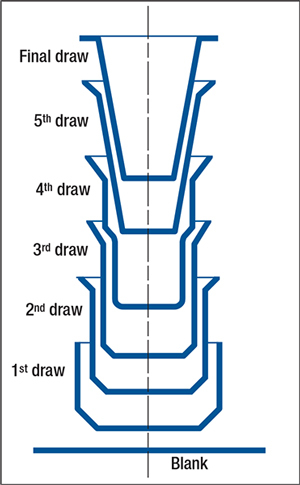 A stepped cup, which has two or more different diameters formed within the cup body, forms by stopping the redrawing process partially through the press stoke. Thus, only a portion of the cup is redrawn. After performing the appropriate number of redraw steps, a final redraw and restrike operation forms the final shape (Fig. 2). Cups with full or partial hemispherical bottoms also require special attention to the forming process. Unlike a flat-bottom cup, which requires simple bending of the blank over the punch-nose radius, dome-bottom cups require stretching of the material across the entire punch face. Thus, cups with dome-shaped bottoms result from a balanced combination of deformation modes—stretching and drawing. The closer that the dome approaches a full hemispherical shape, the greater the need to precisely control blankholder forces. Forces must be high enough to promote stretching of the dome but not too high as to restrict material flow when drawing the cup wall. Ideally, the blank edge will begin to draw in immediately after stretchforming completes. Otherwise, the material will thin too much and cause the dome to tear or fracture. Modern blankholder technology, such as programmable servo-cushions, allows stampers to accurately control blankholder pressure and create pressure profiles that vary throughout the press stroke. This technology permits the application of high blankholding forces to induce stretching and then instantaneously (within milliseconds) reduce those forces to allow proper material flow to produce the cup wall. Axisymmetric cup drawing is rather straightforward and easily understood. However, not all cup drawing is symmetrical about the cup axis. Consider deep drawing elliptical shapes, for example, where the uniform compressive loads found in axisymmetric cup drawing are disrupted. This causes wrinkles to form in the flange due to unbalanced peripheral flow of material toward the punch (Fig. 3). Metalformers can reduce these compressive loads by notching the blank in the smaller radius area, provided that the notch will not affect the final product trim. Again, a programmable servo-cushion may offer a better solution, by allowing the user to selectively apply pressure at specific locations on the flange. This will suppress wrinkles without restricting material flow at other locations. A flat side on an otherwise round cup represents another type of asymmetrical cup. The blank material at the flat portion of the cup may flow too rapidly and leave loose material in that portion of the cup wall. Material flow in the area of the flat may require a higher localized pressure or restriction, via a draw bead.